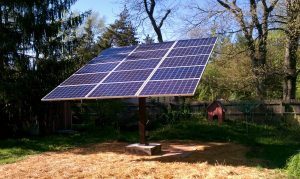 Although the grants from the state of Ohio have expired, there are still grants available for small business or farm owners in rural Ohio to install solar panels and offset their electrical costs. These are called REAP grants. REAP stands for Rural Energy for America Program and they are available from the USDA. The following is taken directly from their grant brochure. They are currently accepting applications for grants and loans for 2012. The program is in effect until the end of 2012. 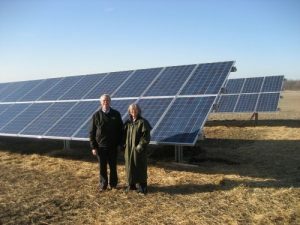 The Rural Energy for America Program is intended to promote energy efficiency and renewable energy development for rural small for-profit businesses and agricultural producers. The loans are intended to provide “gap” financing for energy related projects. The guaranteed loan will not exceed 75% of the total eligible project costs. Combined guaranteed loan and grant packages cannot exceed 75% of the total project costs. Renewable energy systems or energy efficiency improvements cannot benefit a residence. An applicant must be a rural small business or an agricultural producer. The size requirement for a small business is defined by SBA at the following website: https://www.sba.gov/contracting/getting-started-contractor/make-sure-you-meet-sba-size-standards. An agricultural producer is defined as an individual or legal entity which receives 50% or more of their gross income from agricultural. Applicant must be a U.S. Citizen or have at least 51% U.S. citizen ownership. Applicant may not owe delinquent federal taxes or liens. Applicants must meet the demonstrated financial need requirements. Maximum grant request is $500,000. There is a $500 fee for processing the grant application. If the grant is awarded a fee of 1% of the project cost is due. If you are interested in finding out more about this grant and loan, contact SunRock Solar at info.sunrocksolar.com or give us a call at (513) 766-6025.